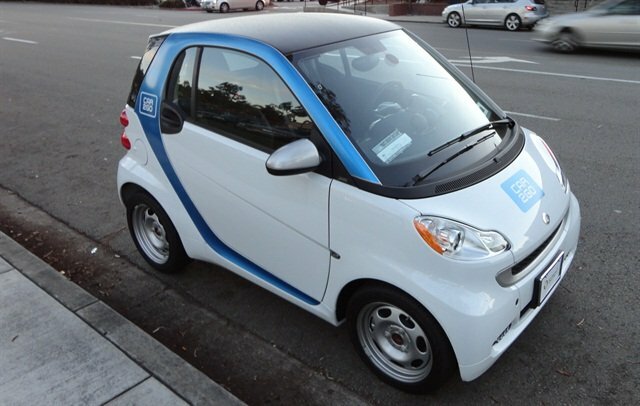 car2go's smart fortwo vehicle. Photo via Wikimedia. car2go has added 75 Mercedes B-Class vehicles to its carsharing fleet in Toronto, Vancouver and Calgary. This is the first time the carsharing company has used four-door vehicles in North America. The pilot program provides over 300,000 car2go Canadian members access to the Mercedes B-Class vehicle, a roomy alternative to car2go’s signature smart fortwo vehicle, according to the company. "As our members embark on new life chapters — whether moving to a new residence or growing their family — we want to continue providing an affordable and convenient transportation option that allows them to go wherever life takes them," said Paul DeLong, president and CEO of car2go N.A. "The Mercedes B-Class will allow us to explore how the four-door aligns with our members' needs, and will also give our members the exciting opportunity to take one of Daimler's world class products for a spin. ..."
The four-door vehicles will be wrapped in the car2go blue-and-white outfit and will be featured in the car2go mobile app, according to the company. During the pilot program, the Mercedes B-Class vehicles can be rented at the same cost as the smart fortwo vehicles (41 cents per minute). For more information, visit www.car2go.com.